Hyundai I-oniq concept car teaser | What Car? This is the Hyundai I-oniq concept car, which will be one of the stars of the Hyundai stand at the Geneva motor show in March 2012. Hyundai has released a single sketch, which shows the overall outline of the car. It has a long, sloping front end that gives it a sporty look, and there appears to be a hatchback-style rear end. Hyundai hasnt released any more details, but it says the I-oniq concept car will preview the next evolution of the brand's 'fluidic sculpture' design language. Thomas Brkle, Hyundai's European chief designer, said: Two strong arched curves define the silhouette of the I-oniq, creating a playful contrast between the sharp character lines and soft but muscular features. Hyundais new i30 goes on sale in March 2012 and it has recently launched the i40 Tourer and Veloster coupe. An MPV version of the i30 is due in late 2012, but its unclear whether the I-oniq will influence its design. The I-oniq concept car was designed and developed at the company's European research and development centre in Rsselsheim, Germany. 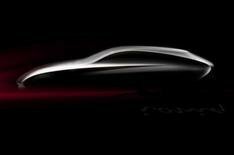 More information will be revealed closer to the I-oniqs debut at the 2012 Geneva motor show.